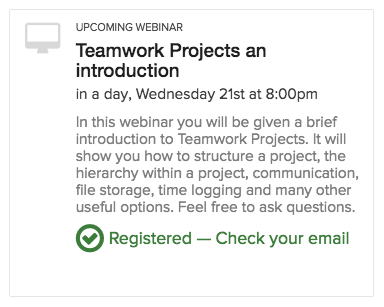 Within Teamwork Projects, you can subscribe to a webinar directly from your installation of Projects. To sign up, click on your avatar/profile image in the top right of your Teamwork site, From the dropdown, hover over Help,then click Support Center. In the Support Center, go to the Webinars tab. Here you will be able to register for upcoming Projects, Desk or Success webinars. When you find the webinar you need you can select Join Webinar. You will then be notified that you are registered and to check your email which will include further webinar information.